If you are reading this, congratulations on making it to Week 15 of the fantasy football season and needing a look at the running back committees. Oh, you were eliminated and still dropped by for a quick read? Good tidings to you, sir or madam! Along with analysis on several notable running backs using PFF’s premium stats, here’s what else I’ll always offer in the neat little chart below: accountability. No doubt, neither Stevan Ridley nor Charcandrick West returned much fantasy value in Week 14. But Jaylen Samuels is a guy who was on our radar a few weeks earlier, and Justin Jackson is someone we looked at prior to a week in which he was out-snapped 49-14 by Austin Ekeler. Both of those players are prime real estate right now as plug-and-play RB2s in the fantasy playoffs. That, in a nutshell, sums up what has always been the aim here: to highlight roster-worthy players before everyone is throwing FAAB dollars at them like baseball execs trying to score a sitdown with Bryce Harper and Scott Boras. Before we dig into the top-three running backs who are trending up or down for Week 15, let’s take a quick look at how things panned out for the players discussed last week. Notes: So much for Ridley carving out an early-down role, as Samuels out-snapped him 48-8. … West was inactive less than a week after being signed off the street. Even if Spencer Ware remains sidelined on Thursday night, Damien Williams is the one in play as an RB2. … Wilson once again operated as San Francisco’s workhorse, although a touchdown would have been the cherry on top. … Johnson may long curse the day he signed an extension to stay in Cleveland. … Ingram salvaged another uneventful day on the ground with a touchdown for owners who started him. … Michel remains the Patriots’ lead back, but with James Develin vulturing three touchdowns in the last two weeks and James White gobbling up targets in the passing game, there is barely RB2 fantasy upside here. Below are five running backs trending up and five trending down in their respective backfield committees. If you are a PFF Elite subscriber, our Handcuff Index chart is a handy reference. Austin Ekeler is out, and Melvin Gordon is iffy at best for Thursday night. Jackson may be the hot pickup for Week 15, but he’s been on our radar since summer. Northwestern’s all-time leading rusher, Jackson has been putting his talents on display when called upon of late. Over the last three weeks, Jackson owns the second-best elusive rating out of 52 qualifiers, even after last week’s relative dud. Prior to Sunday’s win over the Bengals, six of his 20 carries had gone for 10-plus yards. Since Week 12, he has forced eight missed tackles on 25 touches while averaging 3.7 yards after contact. Oh yeah, and this week’s opponent, Kansas City, owns PFF’s second-worst run defense grade and has yielded the third-most fantasy points to RBs. Although Dion Lewis has been trending down for some time, no one can honestly say they foresaw Henry’s outburst against Jacksonville. And while it most certainly was an anomalous performance, the fact is that Henry was the only qualified RB to post a top-10 elusive rating in each of the last two seasons. Well, make that three years, as he now ranks second out of 57 qualifiers in our elusive rating metric, which separates a runner’s ability to create beyond what’s blocked in front of him. Against Jacksonville, Henry forced nine missed tackles on 17 carries, including this totally offensive stiff arm. Even before last week, Henry ranked 18th in elusive rating, as he was averaging 3.2 yards after contact with a 17.9% missed tackle rate. His snap share may not jump significantly, though it would be a surprise if Henry didn’t see 12-15 carries moving forward. Gus Edwards was fun for a few weeks. Whether or not he’s the answer in the Ravens’ backfield is still to be determined, but we already know that Alex Collins, Javorius Allen, and Ty Montgomery are not. We also know that Edwards’ hot streak happened to coincide with the emergence of Lamar Jackson and all the running lanes he creates in the zone read. At the same time, Dixon has turned 16 carries into 96 yards (6.0 YPC) since being activated ahead of Week 13. He also ranks eighth out of 53 qualifiers in elusive rating during that span, whereas Edwards ranks 44th. Against Kansas City this past week, Dixon played eight fewer snaps than Edwards and only four more than Montgomery. 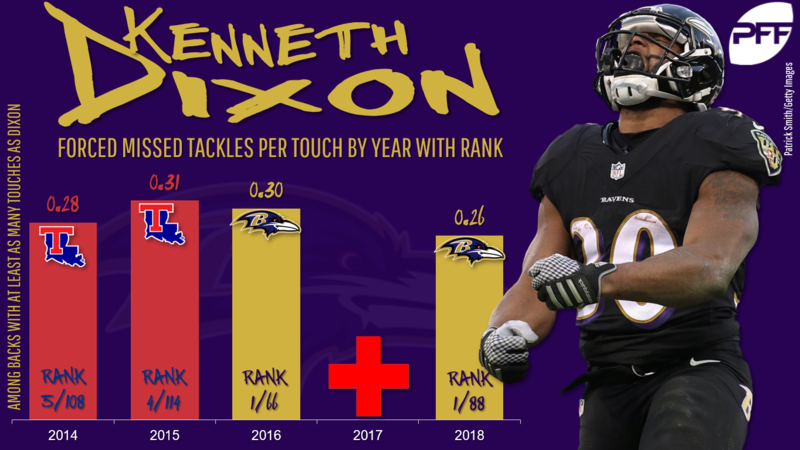 I’d be surprised if Dixon does not see a bigger piece of the pie moving forward, and that certainly puts him on the flex radar on the league’s most run-heavy team. This isn’t a new development or anything, but 2018 is easily McCoy’s most forgettable season. Averaging just 3.3 YPC, the 30-year-old is on pace for just 639 rushing yards, which would be his worst season since his rookie year. 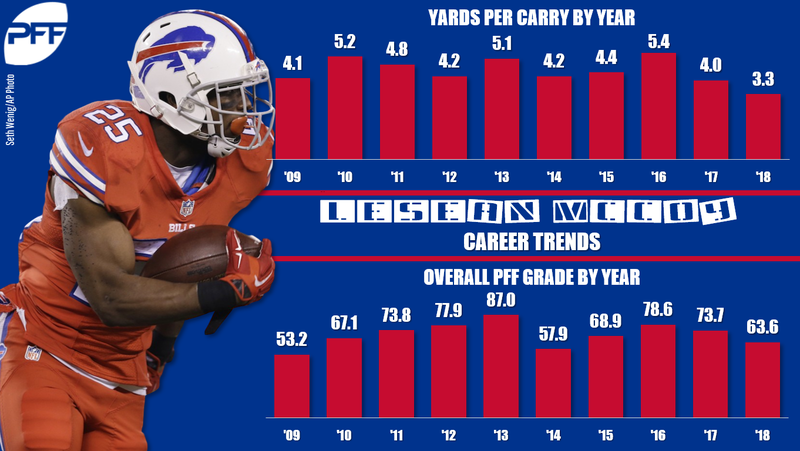 McCoy is also averaging just 12 carries per game, far from the per-game average of 18 carries between 20013-17. Things have been even bleaker of late, with his workload decreasing every week over the past month while Chris Ivory has seen more and more work. What’s more, he is dealing with a hamstring injury that may very well end his season and, looking ahead to 2019, his stature as a viable fantasy commodity. Blount’s fantasy relevance was always going to be tied to when Kerryon Johnson returns, but his fumble last week led to a benching and opened the door for Zach Zenner. Zenner responded with 54 yards and a touchdown on 12 carries. Now, Zenner isn’t somebody you should be looking to deploy in a fantasy playoff matchup, even with Johnson looking questionable at best to return in time for this week’s matchup with Buffalo. However, neither is Blount, should you happen to be among the 40-plus percent of ESPN leaguers who still have him rostered. Yes, all five of his touchdowns have come within five yards, although he sports only an 11.2% missed tackle rate. Barber has logged double-digit carries in nine straight games and continues to operate as Tampa Bay’s lead only viable early-down option. That he is still owned in almost 70% of ESPN leagues and was started in one out of four lineups – in a playoff matchup – feels quite a bit ludicrous. He has 14 catches all year and only one 100-yard rushing game behind PFF’s No. 30 run-blocking unit. Touchdowns are his only saving grace of late, with Sunday marking the first time in four games he failed to find pay dirt. But as we all know by now, touchdowns are far from the being the most predictive indicator of fantasy success. With upcoming matchups against stingy run defenses in Baltimore and Dallas, Barber need not be rostered for those still chasing a fantasy title.